Collingwood have been granted a licence to compete in the national women’s league in 2017. Collingwood Football Club will mark it’s 125th year with the introduction of a women’s AFL team in the inaugural national women’s league. The club was one of eight to be granted a team in the new league kicking off in 2017. President Eddie McGuire described the announcement as a landmark moment for the club and the wider AFL community. “In our 125th year we’ll have a men’s team and a women’s team playing our indigenous game,” McGuire told Collingwood Media from the MCG. The Collingwood women’s team will utilise the club’s $25 million state-of-the art facilities at The Glasshouse as well as Olympic Park Oval, all in the heart of Melbourne’s sporting precinct. CEO Gary Pert said the club’s vision of providing men and women with the same opportunities at the elite level has now been realised. The team behind the 2017 Collingwood national women's league team. In a league-first, the club appointed highly respected female footballer Meg Hutchins to the full-time role of Women’s Football Operations Manager to oversee the growth of women’s football at both Collingwood and the grassroots level. Hutchins said today’s announcement will forever change the way young women view the game. “It’s such an exciting time for women’s football and all the little girls running around. They’re dreams are alive now and they can pursue something that they love,” she said. 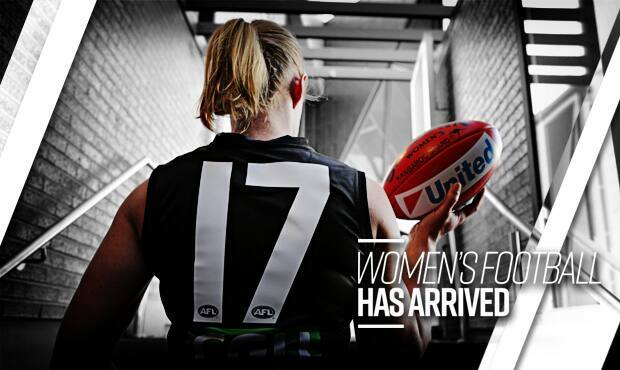 Collingwood will now work with the AFL in planning for the new women’s league.